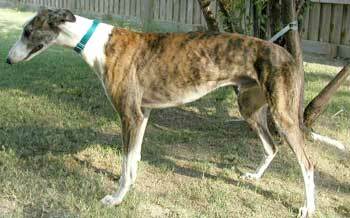 Cooper, formerly Ringo, aka Brazo Ringer, is an almost 8-year-old brindle and white boy, born November 7, 1998. Cooper's sire is Canadian Snow and his dam is Brazo Madam Win. 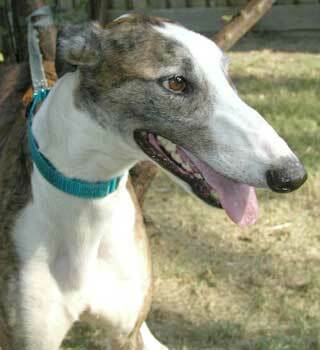 Cooper originally came to GALT with Waco from the animal shelter at Waco on August 6, 2003. He raced here in Texas at Gulf Greyhound Park and Corpus Christi from December 2002 to April 11, 2003, racking up 125 races. 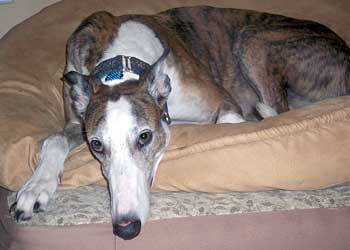 Cooper was first adopted into a home for almost a year, but because of family changes he was returned to GALT. Then unfortunately his second home was not to be his forever home either. It has always been known that Cooper is not cat tolerant, and when the family adopted a kitten, he was returned. 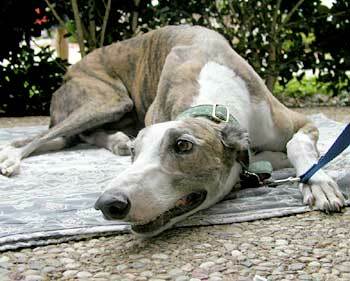 Cooper is very, very people oriented and one of the happiest greys ever, with an outgoing and friendly personality. Cooper is not cat or small animal tolerant. "Super Cooper" is a perfect name for this handsome, almost 8-year old boy. His manners are impeccable and his joy at being a companion is evident in the way he keeps you in his sight and just likes to be near you...but not in a needy, clingy way. He loves to be petted and just melts into you. And he's a major-league snoozer...he takes retirement very seriouisly! Cooper's last home did not work out, much to our surprise. Cooper is not small animal tolerant, and that's something we and his former owner knew. Regardless, they got a kitten and, of course, Cooper was way too interested. To our amazement, the kitten stayed and Cooper was returned. It's certainly their loss as he's a beautiful, sweet, affectionate, laid-back boy...but no kitties or small doggies, please. He does do best with another Greyhound or other four-legged friends of a larger size to keep him company when you're gone. He doesn't crate - doesn't need to - and has been perfect since he came into our home. 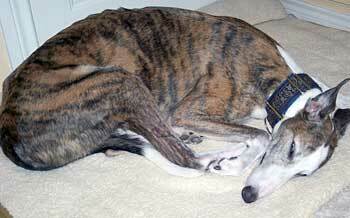 We have two other male Greyhounds and all three have gotten along famously. Cooper walks very well on the leash and is good in the car. Loves squeakies, great appetite, sleeps quietly at night (OK, he snores a bit but who doesn't? ), and just generally enjoys hanging out. What's not to love?...and you will fall in love with this beautiful "Super Cooper."